Nature is a wonderful thing, and the different seasons we enjoy mean there is always something to look out for, especially when it comes to snow! Winter is the season when we have the most work to do – especially for those in areas where snowfall is likely. Snow may look beautiful blanketing the ground, but it’s very troublesome when it comes to getting to work, going to the shops or getting the kids to school. The traditional method of clearing snow is to get your heavy coat and gloves on, get a shovel out, and start shoveling that snow. It takes ages, is hard work, and is the last thing you want to do on a freezing cold morning. 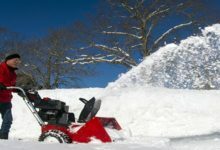 You may have seen neighbors, or perhaps friends and family, using a small, and effective snow blower – so why haven’t you got yourself one! These very useful machines are easy to use, can shift a lot of snow, and are not expensive, so let’s have a quick look at how they work. 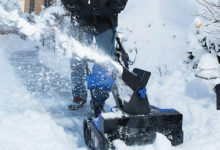 First, let’s clear up something that is likely to confuse you: you may see these items referred to by three names – snow blowers, snow throwers, and one of the best for home owners, snow shovels. They each do the same thing – they shift snow from where you don’t want it far more quickly than with a shovel! How do they do it? We’re talking about a compact machine that is electrically powered, either by standard mains connection or by a rechargeable battery, and that is light enough for all the family to use. 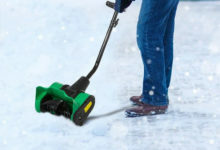 Whether you choose a corded thrower or a super portable cordless electric snow blower the purpose remains the same, an electric motor powers an auger – this is a set of blades on a roller – and the auger scoops up snow as you push it along. It deposits the snow in a chute, and it is thrown clear of the area you want to clear. So let’s have a look at our top 10. We begin our reviews with this model, from Greenworks. 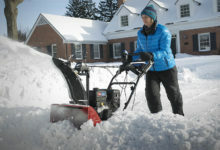 This one is a corded snow shovel – so you need to have it plugged in at all times – and given the size is designed for use in smaller areas, where light to medium snow is expected. The fact it is not a cordless model may put some people off, but rest assured this is a brand with a reputation for quality products. It has an 8-amp motor, which is plenty for the job this one is designed for. We mentioned different sizes above; this one has a 12-inch auger, so will be able to clear a width of around a foot when in use. It is designed to shift up to 6-inches in depth – this is determined by the diameter of the auger – and has many satisfied users. 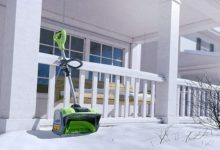 It’s easy to use – there are no cords to pull as it starts with a switch – and light at just 14lbs, and will happily clear snow from everything from grass to wooden decking. Toro claims to be the leading brand in small snow shovels in the USA, and we have no reason to question that claim when we have reviewed the Toro 38361 show shovel before. This very neat and small snow shovel is an easy to use model that follows the usual design concepts – think of these as perhaps a lawn mower for snow – and is very simple to use. Weighing just 12.5lbs and with a fully adjustable handle, this one is perfect for younger members of the family to use. This model is also a 12-inch one, and can clear a depth of 6inches at one time. If that is the sort of snowfall you expect, it can clear a 50x20foot driveway of 4inches of snow in 20 minutes – try doing that with a shovel! This is another corded model, so is suitable for smaller areas although it comes with a length cord, and it is designed to be ergonomic for the user and comfortable to use. Worth checking out with a 2-year warranty. Another of the leading names in this line of products – and others for winter use – is the Snow Joe iON, a brand associated with a great range of quality items. This is the first of our cordless models, and that does carry some advantages. First, it means you are NOT restricted by a power cord, and it’s also one less thing to trip over in the dark! Charge it overnight and you get a little less than an hour’s usage – given it can shift 300lbs a minute, you’re looking at similar clearance to the model above. This one comes with all the usual features including an adjustable handle, easy-start mechanism and weighing in at just 12lbs. It offers a clearing width of 13inches, and a maximum depth of 6inches, and is very simple to move around. It can throw the snow as much as 25ft, and is usable on all surfaces, and you will find that it is designed to prevent damage to, for example, decking. A good cordless model from a known brand, but beware you’ll pay a lot more for this one than for either of the above. This model, from WEN, takes things to a different level in terms of performance. The first thing we will say is that it is somewhat bigger than any of the above; this is to accommodate an 18-inch wide auger and one that can cut as much as 7.8 inches deep. It will, therefore, clear much more, in fact it can handle 490lbs of snow per minute, thanks to a 13.5amp motor and that large auger. This one comes with all the adjustments to the handle, to the height and even to the direction of the chute, which can be turned 180degrees for convenience and can throw the snow some 20feet away. It’s very powerful, then, and will be useful for those who perhaps expect more than the average snowfall. It is, however, a lot heavier than the lighter versions at 32lbs, but does fold down to quite a compact size when not in use. 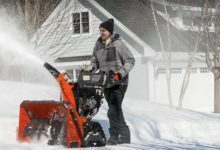 If you are looking for a snow blower that offers a wide clearance depth but is still lightweight, then we recommend strongly that you check out this particular snow blower from Earthwise. They might not have the presence of some of the other brands here, but this is certainly a worthy contender on this list. It’s a corded model, so if you’re clearing a wide area you may need an extension, but it is very easy to use. This one has a 16-inch clearance width, and can clear as deep as 8inches at one time. The claimed clearance rate is 430lbs per minute, which is very impressive for a model that weighs in at only 16lbs. a 12-amp motor that can provide 4500rpm enables such performance, and it comes with a fully adjustable handle, a movable chute, and also a 30-foot throwing distance. Also competitively priced. We have unashamedly included a second item from the Snow Joe range, primarily because they have a wide collection of snow blowers and other items that gain very good customer reviews. This one is a larger model than the Snow Joe we reviewed previously and offers a 13 inch clearance width plus a 6 inch maximum depth. That is, about the standard for a machine of this size. 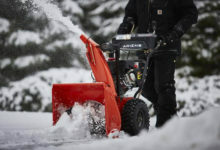 The reason is it is much more powerful than the other Snow Joe model – it has a 12-amp motor and can deliver as much as 400lbs of snow per minute – so will make your job a lot easier, and quicker. It is a corded model, so without the freedom of cordless, but you can always use an extension and it can throw snow some 20-feet. It’s made to the usual Snow Joe standards and comes with a nicely designed, and an adjustable handle that is comfortable to use. We are back with a model with wider clearance. This one is from Outsunny, another brand with a wide range. It’s a good model, and can provide you with a 16-inch clearance width. The maximum depth of snow is 6-inches deep, and it is very capable on all surfaces. This one can shift a claimed 700lbs of snow a minute, which is rather more than any other so far, thanks to a very powerful motor. It’s a corded model, throws snow up to 20-feet and has an adjustable chute, plus it is easy to move around on large wheels. It weighs 20lbs which is not bad at all for a machine of this type, and it comes with a fully adjustable handle and adjustable chute. If you perhaps have a larger area to clear then this could be the one for you, and it’s not badly priced at all. As one of the bigger models here, this one also claims to move 700lbs of snow per minute, so if it’s a lot of snow you need to clear it’s worth checking out. Specifications include a powerful 9-amp motor, which is sufficient enough, plus a 16-inch clearing width and the usual 6-inch depth. The motor is high-revving so it helps clear a lot in a short while. This one is also corded, nicely made and can throw the snow 20-feet to clear your path. This is one with a lawnmower-type handle with a crossbar – some are more like, for example, a garden strimmer – and as such it is a larger model than many and weighs around 24lbs. It is fully adjustable, however, and easy to use as such. The chute adjusts 90-degrees each way, and it has an easy start system and a long cable. At the price, it’s very good if you want a bigger machine. As we near the end of our selections we thought we’d introduce one of the big boys: this one has a 20-inch wide clearance path, so you can make a nice pathway in no time at all. Remarkably, it can also clear up to 10-inches deep in one pass, which is more than any other here by some way. That makes it the ideal model for those of you who may live where more snow that usual is forecast. 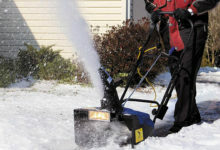 It’s a heavy duty machine with a 13-amp motor, can throw snow 20-feet, and has the adjustable crossbar type of handle, with easy start mechanism. The chute can be adjusted through 180degrees and it is heavier than most at 27lbs, but if you need a large area cleared quickly, it might be the one for you. Well made, if large, and decent model. Our final entry is another from Greenworks, and it’s one of their bigger models. As above, this one has a 20” clearance width and can clear up to 10 inches deep. It’s a corded model, as all but one of these are, and it is equipped with a powerful motor that allows it to clear a large amount of snow in a short time. This one is suitable for people who live in areas of heavy snowfall and is from a top maker. The downsides to this model are the size – it weighs some 30lbs and may be too heavy for smaller or younger users – and the fact it is corded, although it shares that in common with eight others on this list. It is sensibly priced for a large machine, comes with the fully adjustable handle set up and quick start, and has 7-inch wheels for ease of movement. If you need a heavy duty model, this is worth looking at. That’s our top ten for you, so which the one you need? Let’s have a look. The choices here are spilt into two – heavy duty models, or small and light. If you need a big one, you should have a look at either of the final three on our list, as each is a very capable machine. For a smaller, portable model, we can’t help but recommend the Snow Joe model at no. 3, which while costly it is a handy cordless snow shovel. If you are on a budget, check out no.5 from Earthwise. Meanwhile, get yourself one of these now, and make the coming winter that much easier!